The other evening I was having dinner with the family while a group text with girlfriends was happening on my phone. I didn't pick up my phone until after dinner, only to find that I had 59 new alerts. Fifty-nine texts that I'd missed out on, some several sentences long, and all about CALENDARS! That's right, the hot topic of conversation was this -- how do you keep yourself and your family organized? Job obligations, travel plans, fitness classes, menu planning, weekends away, household chores, football games, doctor apointments, coffee with girlfriends, playdates, grocery lists ... WOW. We have a lot on our plates, and a very empassioned discussion was started about what works for each person. 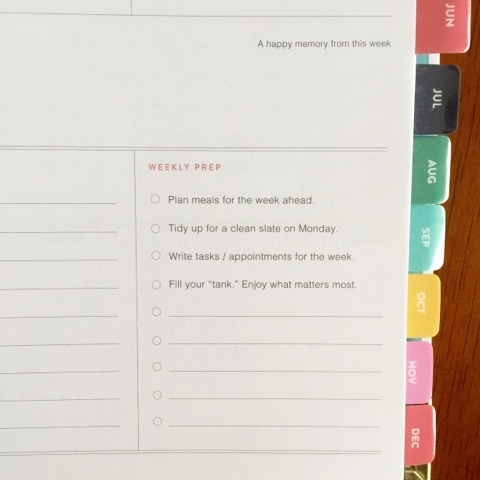 For 2016, I will be using the Emily Ley Simplified Planner. The 2016 versions of her planner just launched this morning. I was able to get a sneak peek at the planner and wanted to share with you my favorite parts about the particular design of this one. 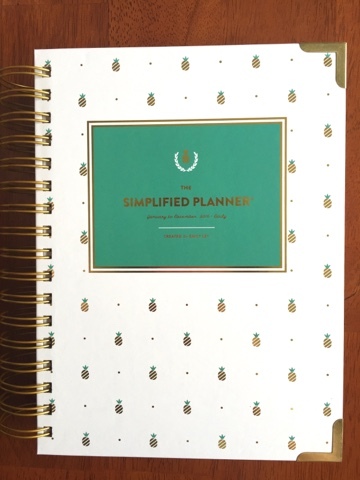 The Simplified Planner is spiral-bound and features hard front and back covers and reinforced metal corners. Each page has an inspirational quote at top. 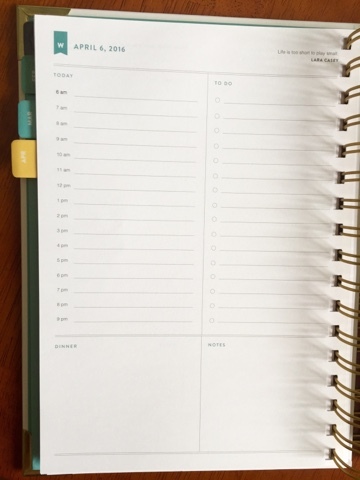 I've never had a planner with this feature, but I think it is truly a very nice touch. At the end of each week, pre-written checklists are a handy tool for preparing for the week ahead. There are obviously extra slots to add in your own tasks -- pick up dry cleaning before work Monday, take donations to Goodwill, clip and organize coupons, back up photographs on computer, whatever it may be that will get you in the right frame of mind for the next week. Each day has a separate page organized by the hour with a separate, non-time-related to do list to the right. There is even a space for dinner plans for that day and any additional notes you need to jot down. I am really looking forward to filling up this planner with our daily tasks and helping to make our lives a little more SIMPLE! ... and a classically pretty version, Mint Dot, that was the one that made my decision a hard one. It's so nice and clean! I'd love to hear how you keep your family organized. Also, which cover design would you select? Oh gosh, I need to simplify! I have a large planner at home to keep everything straight (currently a 6 month of 2015 + 12 month of 2015 one...), then a mini version of that same one I keep in my purse, then a running 'to do' list on my iPhone in Notes, and of course my work gmail calendar. Needing sanity now! April! This planner looks so well put together! I love the pre-written checklists + space for you to add your own items! I am like you- I keep all of our families' activities in my planner and if something involves my husband- I put it on our shared iPhone calendar. I am currently using a planner from Plum Paper Designs and I LOVE it! My husband got it for me for Christmas last year and I will be asking for another one this year! I will have to take a look at the Simplified planner as well! Hope you are having a great day! 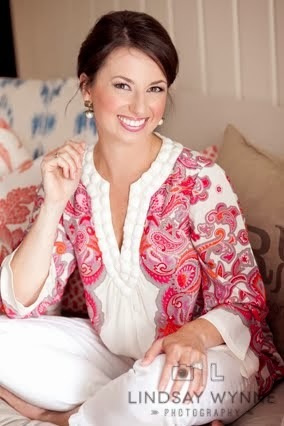 I was torn between Emily Ley and my current love, an Erin Condren Life Planner for 2016. Ultimately I went with the ECLP because I prefer the weekly layout and the bonus items you get in her planners, but I'm still thinking that one day I may give Emily Ley a try! I just love her! And my preference would definitely be the Happy Stripe! I love color! Such a pretty planner! I have one now that I love but I've always admired this one too! I love Emily Ley's products. She seems like such a lovely person and everything she makes is beautiful and functional! 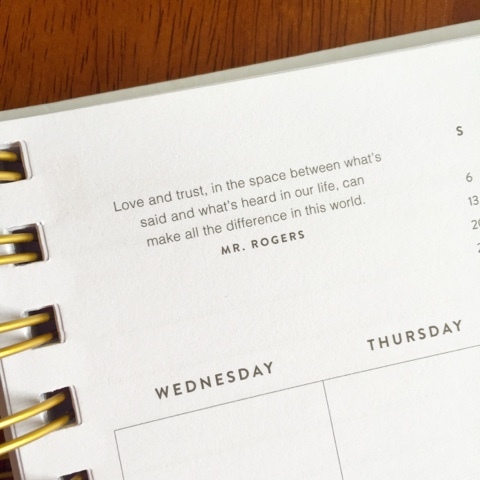 Personally I love the Erin Condren Life Planner as that's what I have now and am getting next year (but in the horizontal layout format). I did waver between the EC one and the Emily Ley one and might need to give this one a try the year after! Oh my... I would have a hard time choosing between the stripe and mint dot. I just shared my own thoughts on staying organized using Evernote. I will continue to use it, but my nerd-like tendencies just love super cute planners and notebooks. :) Thanks for sharing! It's funny that all of the ladies above seem to have heard great things about Emily Ley and her calendar. I've had be exact opposite. Every time I google calendars(I've used Erin Condren for years), the drama between EL and Whitney English comes up. This year's and supposedly next year as well EL was terrible-bad quality in paper, etc...and it unfolded on many different media platforms. EC was also the same way-so no one is perfect. I'm only saying this because some gals don't do research and instead go with the latest trend. I cares lots out paper calendars because that's all I can really use at work(I'm a nurse and we can't really use the personal computer in patient care areas) and actually went to target to look at the new WWhitney English simplified planner(WAAAYYY cheaper) and ultimate decided on the 2016 planner from paper source. Long story short-I'm kind of sad that you jumped on the EL bandwagon when she clearly has ripped her ideas off from other people and charged an arm and a leg for a less than stellar product. I've read your blog for years and agree most of the time with what you endorse, but this-na ah. Sorry. Erin, I also was really impressed with the Paper Source calendars this year (haven't seen them in person, I should mention). Some are still pricey, but I get the catalog and thought several of them looked really nice, and the cover designs were very pretty. No need to apologize for disagreeing with me on this review! The EL planner completely suits my wants and needs for 2016 and I totally get that different people prefer different planners for a multitude of reasons. That's why there are so many on the market! I was sent this planner c/o EL (I'm not sure that was super clear above when I said I was able to get a sneak peek of it), but it was made very clear to me that a review on my blog was completely optional. I was aware of some of the concerns some people had, but I personally have not experienced bad paper quality or any other issues. In fact, I REALLY like it, which is why I did choose to blog about it. Just my two cents, but I appreciate your opinion too! :) PS - congratulations on your recent wedding! I had no idea that there was this much drama about planners, like I said a quick google was kind of eye opening. I really wish people didn't have such negative experiences because I would have tried her planner but was really turned off with the reviews. As an aside, I do like your reviews that you've done in the past. Your posts are pretty honest and that's nice and a relief. Thanks-we are still over the moon about being newly weds. Is the Mint Dot more mint or blue?I'd love to jump on the EL bandwagon but I don't love her covers right now...so superficial! Nina, I haven't seen it in person, but in the multiple photos I've seen of it (in different lighting), it appears more mint to me. I do know that Swoozies is carrying them if you happen to have one near you? That way you can check it out before purchasing! XO! Her planners are adorable and seem amazing! At this stage in my life, I like the May Designs planners because they're lighter and I don't need all that detail. I could definitely see myself using one of the Simplified Planners when I have kids! I'm a daydesigner fan (and I purchased one last year) but I often find it a little ludicrous they charge so much for a planner! I'm a paper planner kind of person and went the bando agenda route this year. It covers August 2015-December 2016 and it's fantastic. Super fun and funky with exactly what I needed to keep my life together. That's the best part about planners: there's one for every person's tastes and needs.